The Bulbz indoor flood light (Model LBR30Z-1) is a Z-Wave light bulb that has the characteristics consumers want in a flood light form factor, with the added capability of remote and automation-system control. It’s a great solution for consumers who want to have ’scene’ or remote control capability on their recessed ’can’ lights or track lighting fixtures, without having to mess with any electrical wiring – it’s as simple as screwing in a bulb! 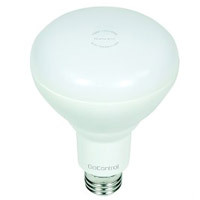 By simply removing the regular flood light bulb they now have, and screwing in this Z-Wave LED dimmable indoor flood light bulb into their fixtures, they get the tremendous benefits of being able to control their lighting using their smart phones or tablets through their hub/controller’s Z-Wave app, and creating automation ‘scene’ control for setting the right mood, or making this light turn on or off when other Z-Wave devices are activated. This light is also controllable using the 2GIG (or other) security & automation systems, and via its remote app interface. Annual energy consumption (@ 3 hrs./day, 11¢/kWh) is only $0.90!